From Villa LuWih’s secure carpark, stepping stones lead across a lawned garden, passing the open-fronted pool bar and one of the pools before reaching the main villa building which faces out to the unobstructed, wide ocean views. On the villa’s ground floor are two bedrooms a living room, a modern fitted guest kitchen with breakfast bar, and a separate dining room. Up one level are two further bedrooms, the media room, the second swimming pool, and a sitting area surrounded by folding glass doors that can be opened up to the tropical air or closed for air-conditioned cool. Finally, stairs from the ground floor lead down to a lower level where two more bedrooms are privately housed and open onto a small walled garden. 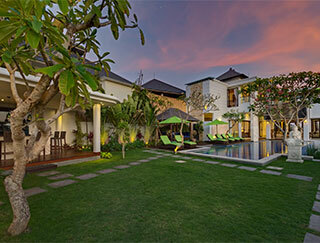 Villa LuWih offers six spacious, luxurious, air-conditioned ensuite bedrooms. Intricately carved wooden panels form ornate backdrops to the beds, all of which are dressed in crisp linen, accented in brightly coloured silks and swathed in romantic white-net canopies. With marble floors, white walls and simple but elegant wood and rattan furniture, bedrooms are equipped with 40-inch flat-screen TVs and telephones. The two bedrooms on the lower ground floor make an ideal family suite. The king-bedded room has its own sitting area and a bathroom fitted with a twin vanity, rain shower, and sunken bath. Next door is a twin-bedded room, ideal for children. From both rooms, sliding glass doors open onto a landscaped walled garden. On the ground floor are two elegant king-bedded rooms, one facing the pool through floor-to-ceiling sliding glass doors and the other with sea views through the glass fronted living area. Occupying the villa’s top floor, are the remaining two bedrooms. Both are furnished with king beds and present fine ocean views through walls of sliding glass doors.